Billy Stanlake ~ an extremely tall fast bowler at 204 centimetres, won a surprise call-up to Australia's one-day international squad in January 2017 to play against Pakistan. Stanlake impressed selectors with his pace and bounce; he was picked by Sunrisers Hyderabad but had to leave at the start after he fractured a finger in his right hand ! ~ he is in news for wrong reasons. Cameron White has played 4 tests – all against India in 2008 series ~ he has been a good batsman though – former Australian batsman Cameron White was hit with a vicious Billy Stanlake beamer in the first JLT Cup match in Townsville. Queensland’s Stanlake, who can hit speeds of up to 150km/h, had a bad case of early season rust, going for 20 runs off his first two overs. White, representing Victoria, had only faced four balls before Stanlake’s beamer struck him in the shoulder. It was indeed a scary moment in Townsville, but Cameron White was able to shake it off and the Doc has given him the all clear to continue his innings against the Bulls. 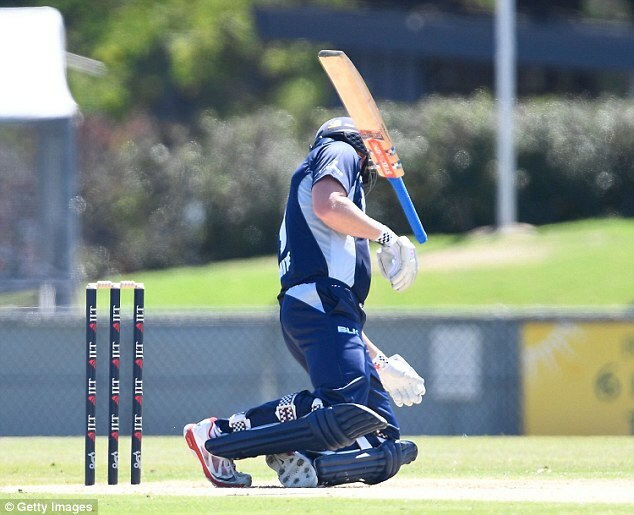 The cricket.com.au commentators were worried about the blow, initially thinking it hit White in the helmet or throat. “It just slipped out of his hand, Billy Stanlake, and Cameron White has copped it,” the commentator said. “It was certainly dangerous.” Doctors cleared White but the ball seemed to rattle the 35-year-old, who wasn’t able to kick on. White struggled after the blow, limping to 10 off 35 balls before being caught by Chris Lynn after top edging a pull shot off Jack Wildermuth. Stanlake improved from there to have 1-29 off six overs. Victoria were languishing at 4-66 when White was dismissed but a big partnership from Glenn Maxwell (80) and Nic Maddinson (68) stabilised the innings with a 101-run partnership. It’s a good response from Maxwell who was told to score more centuries if he wants to be selected for the Australian team but again falling short of the triple figures. Maxwell was snubbed by selectors last week, who named a Test squad to play Pakistan in the UAE. MailOnline raises concern on - Why weren't people offering help?' at that scary moment when White was struck on head. Queensland's Stanlake, who can hit speeds of up to 150km/h, delivered the illegal bowl, which appeared to hit the 35-year-old in the helmet or throat. Cameron White was lucky to escape injury ! ~ as he collapsed on the pitch after being hit, commentators speculated whether or not White had been hit in the head, but it was later revealed the ball hit his shoulder. Relating it to the past, many fans took to social media to share their thoughts about the illegal bowl. 'God, why weren't people offering more urgent help? And why didn't the umpire send the bowler off straight away? And why didn't the bowler appear to be very worried or very apologetic??' one person wrote. 'How does an international pro bowl a ball that bad??!! Very dangerous at that pace and well done to White for the evasive action. This could have been nasty,' another person said. The concerns for White comes in the wake of Australian cricketer Phillip Hughes's death, who died three days before his 26th birthday after he was hit in the head with a ball. Hughes was struck in the back of the head by a ball delivered by bowler Sean Abbott in 2014, and he never recovered from the devastating head injury. After collapsing on the pitch, Hughes was rushed to St Vincent's Hospital and was placed in an induced coma but tragically died 48 hours later. There have been many Cricket injuries – most of them came under hostile conditions like the Kingston carnage when Holding, Daniel and others ripped off India, when Sarfraz, Imran, Wasim Akram, Akhthar struck, Bob Willis bounced or Australia served bouncers from slinging Thomson, Lillee, Walker and more ! When I faced Holding, I received 4 bouncers in an over and a beamer… the next over from him was the same – when he again said the beamer had slipped, I understood that this was a strategy to intimidate. Lloyd fearing his future as Captain finding us 98 for no loss was desperate and utterly frustrated. ……………. The carnage ensued .. in the pavilion, there was none to attend to Anshuman Gaekwad. Jamaican ticket authorities showed no regard for the seriousness of injury. The whole thing was sickening. Never have I seen such cold-blooded and indifferent behaviour of Cricket officials, and the spectators to put it mildly, were positively inhuman. – extracted from Sunil Gavaskar’s description of the carnage at Sabina Park. I have posted earlier on ‘worst injuries on Cricketing field’ - In his debut series, Sachin was injured and batted with blood and rose to eminence. There are very many other stories but a very harsh one was that of Contractor and the worst being that of Raman Lamba. Nariman Jamshedji "Nari" Contractor , the left handed opener born in Godhra, had two ribs broken by Brian Statham at Lords in 1959. Contractor led India to a series win against England in 1961-62 and captained the side to West Indies the same season. There, in the match against Barbados, he was struck at the back of the skull by Griffith and was unconscious for six days, requiring a blood transfusion; his life was saved but his international career was abruptly ended.